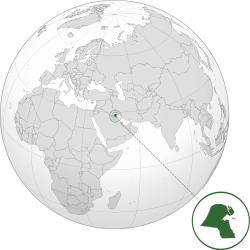 Kuwait is a small country (about 17,819 square kilometers) in the Middle East. Kuwait is the most socially progressive country in the Gulf region. It has a small and rich economy. It has about 96 billion barrels of crude oil reserves. Crude oil reserves are the oil that is still under the ground and has not yet been cleaned up. Kuwait has 10% of all of the oil reserves in the world. The country makes a lot of money by selling oil. This money is almost half of all the money the country makes. The oil money is also 95% of the money made by selling things to different countries (people call that exports). Also, the oil money is 80% of the money the government makes. Kuwait is now talking with oil companies of other countries to make oil fields in the northern part of the country. Kuwait's weather makes farming hard (too little rain). Instead of farming, the country catches fish and buys food from other countries. About 75% of the country's water to drink has to be distilled (have the salt removed) or purchased from other countries. In 1990, Iraq invaded (brought an army in to fight against) Kuwait. This started the first Gulf War. Kuwait's official religion is Islam, although 15% of its population are Christian or Hindu. Arabic is mostly spoken in Kuwait but English is widespread among Kuwaitis (residents of Kuwait). Kuwait is one of the few nations that has education for every age. Population (in thousands) for 2004 2595. CBR(per 1000) for 2004 19.4. CDR (per 1000) for 2004	1.9. Growth Rate(%) for 1992-2002 2.1. the Total Fertility Rate	for 2002 is 2.7. Percent population is living in urban in 2003 96.2.Per capita gross national income ($) 2002 612. Population Density( per square kilometer) in 2000 107.4 Infant Mortality Rate (per 1000)for 2005 9.95. Adult literacy rate (85%) female literacy rate (81%) (2002). 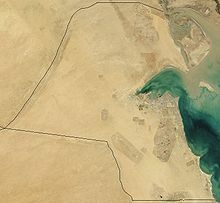 Kuwait is divided into 6 governorates. The governorates are divided into districts. ↑ 1.0 1.1 "Kuwait". The World Factbook. Central Intelligence Agency. 10 April 2015. Archived from the original on 2 July 2014. ↑ 4.0 4.1 4.2 4.3 "IMF Report for Selected Countries and Subjects : Kuwait". International Monetary Fund. Archived from the original on 24 February 2018. Retrieved 1 April 2017.